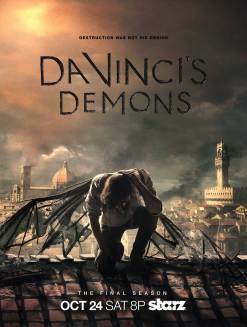 Now thoroughly uprooted from Florence, the multitudinous locations of the many-stranded narrative leave Da Vinci’s Demons flailing aimlessly a little too often, with a sense of confusion about where and when (and indeed why) things are happening and not enough of a grand design emerging, drawing the pieces together with increasing clarity. The most frustrating part of this is the prominence of the programme’s internal mythology, pitching the Sons of Mithras (now bad) against the Labyrinth (possibly good, I think). It’s an additional level of conspiracy theory that just isn’t needed in a period of history that is so rich for pickings – the de’ Medicis themselves, fierce rivalries of the Italian city states, the advancing Ottoman hordes… Plus there’s a considerable cast of characters who just aren’t given enough to do, especially as new ones keep arriving. Perhaps the knowledge that the show was ending would have reshaped the writing a little but that’s no excuse really. So key characters are killed off (big mistake), Lorenzo is M.I.A. for half a season once again as he’s captured, the rise of Vanessa and Nico in his stead – an unexpected but fascinating turn of events – is given short shrift. And the complexity of Leonardo’s family connections is ramped up but to no satisfying degree, with a series of frustrating decisions denying us some dramatic scenes. Only with the return of some of old-school (Series 1) inventing do the sparks really ignite, leading up to the finale. And it’s a shame that the fluidity of Da Vinci’s sexuality, acknowledged at least for one episode back in Series 1, has fallen entirely by the wayside, the homoerotism of the last series notwithstanding. This time round, there’s not even that but the directors do at least give us a couple of instances to admire the results of Renaissance training programmes with both Riley and Ritson flaunting their abs for all to see, Riley even mudwrestling shirtless at one point, and Elliot Cowan getting his buttocks out for us all to enjoy. It has not been without highlights – Riley has never been less than hugely watchable as Da Vinci himself with all his vicissitudes and vanity, though the belated recognition of his culpability in inventing all manner of war machines was particularly well done this time round. Blake Ritson’s Riario has taken the more interesting character turns given to him and run like the wind, the return of Paul Rhys’ magnificently camp Vlad is a masterstroke and though the female characters have largely been under-served (I don’t think they’ve known what to do with Lucrezia since the end of Series 1), it was fun to see Eleanor Matsuura shine as she rose from madam to statesman. But I think the loss of creator David Goyer from the helm and the introduction of new showrunner John Shiban did Da Vinci’s Demons no favours for this final season. Whilst it is impressive for a cable show to make it to three seasons, an innate lack of clarity about what the show’s strengths were is apparent throughout, making this sadly the weakest of the three.